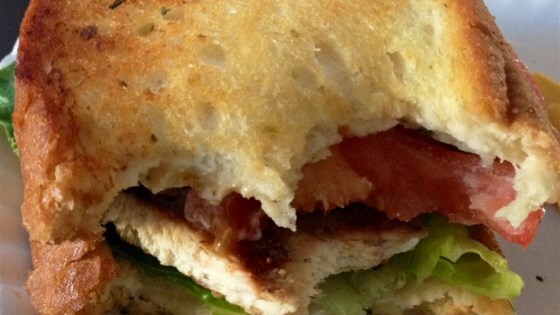 "Delicious and tender grilled chicken on a bed of lettuce, tomato and mayo sandwiched between two slices of toasted French bread. Bacon and provolone cheese can also be added to sandwiches." Prick chicken breasts all over with a fork. Place chicken breasts, 1/4 cup olive oil, white wine vinegar, lemon juice, garlic and herb seasoning, ground black pepper, and chopped fresh dill in a bowl. Stir to coat chicken breasts completely. Let stand for 10 minutes. Remove chicken breasts from marinade, discard marinade, and grill chicken for 10 to 15 minutes on each side, or until juices run clear and an instant-read meat thermometer inserted into the thickest part of a breast reads at least 160 degrees F (70 degrees C). Remove from grill; let stand for 5 minutes. Cut chicken breasts in half. Melt butter and 2 tablespoons olive oil in a skillet over medium-high heat. Sprinkle garlic powder and salt over butter and oil. Add French bread slices to the pan and toast until golden brown on one side, about 3 minutes; remove from pan. For sandwich assembly, place one slice of French bread with toasted side down onto a serving plate. Spread mayonnaise on bread; top with a slice of tomato, salt and ground black pepper to taste, half a grilled chicken breast, and lettuce. Spread untoasted side of another slice of bread with mayonnaise and place on top to make a sandwich. Very good. I used thighs instead of breasts. No cheese because cheese on grilled chicken seems too weird. Along with the lettuce and tomato I added pickle and onion, Quick, easy, and economical!